I prefer pens whose ink glides evenly onto the paper. Cheap ballpoint pens are right out, due to their scratchiness. Even more than that, I'm looking for writing utensils which are a little thicker and have padded grips. I grew up in the word processor generation so I find my hand cramps when writing pretty early on. I need my tools to be ergonomic and support good habits to keep pain away. It's sad that people don't consider this more than they do. If you are busy worrying about how uncomfortable you are, you're probably not devoting as much energy to the assignment at hand as you should be. I am not a bit concerned on what type of paper I would write on. As long as it can serve its purpose, I am ok with that. I am picky with my pen though. I prefer pen has a smooth feel when you write them and it must have a thick imprint. I actually have a prefered brand of pen and I want it to be black. I don't use sign pen or blue ballpen that much. Even with pencil, I only use 2B or 4B pencils and it must be with my preferred brand. I can be. Some pens can smear if you lay your hand on the paper too much and especially if you're left-handed. I'm not left-handed but either way, cheap pens/markers can really mess up your hard work. Most companies would prefer a clean paper without smears and I've witnessed it at times and especially at school as well. I once had to redo an entire paper just because the teacher couldn't read a few smeared words. It not only saves you a few extra cents to purchase a decent pen but it also can save you A LOT of time. I would say that I am slightly picky when it come to writing material, I tend to just get good black pens and mechanical pen. Though, I always have some good spare ones at home. I would suggest buying in stock to save you time and a bit of money if the future. I am not as picky with notebooks. No, I am not picky as long as a pen or pencil works fine. I don't care whether the pen I am using is worth 10 cents or costlier but the only thing that matters is that it should write flawless. As far the writing paper is concerned I prefer recycled paper since it costs lesser and is less harmful for the environment. By the way I am buying paper mostly for printing purpose. , that has sales all year through so we can get stationary and art equipment at sales or when Colleges and Universities ask a lot from students too so regularly you'll see younger people in the store looking for equipment all the time. It's right on the way to Walmart, so I pass by regularly. 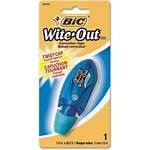 I need Wite-Out by Bic all the time, aside of pens, pencils and tablets for writing. I love writing in longhand, to keep as a record with date on them of all my writing ideas and outlines and books. One thing I find when writing is to keep constant with characters and their names. We do have other words as writers we have to be aware of like medical and electrical terms blackout, computer term brown out, color off white, even hot dog the product name of frankfurter or Pepsi just a name of a soda...many words in other's language is a different meaning or taking literally is just not correct or have any connotation with nationality or people. I go to Walmart to check out stationary prices too, which went up this year. I like very inexpensive stationary. As for mechanical pencils I like one I found that doesn't break on me, Pentel E-Sharp that I like. I'll try things on sale too, hoping they'll last in my hands. Prosperous e-book or book sales!